This is a community-run festival which relies on local residents, businesses and organisations for its success. Are you interested in volunteering or advertising? Great, the Hay Walking Festival committee would welcome your support! Become a walk sponsor for £25. Your business name will appear alongside the walk title and a link to your website will be included from the online brochure. NB: If you are a walk leader, there is no charge – i.e. you get “free” sponsorship of a walk in return for leading it. Finished adverts and payment must be submitted by the beginning of March 2019. The programme will be A5 portrait. Please email info@haywalkingfestival.com to book advertising. Are you an experienced leader with knowledge of the Hay area and a passion for walking? We’d love to hear from you. 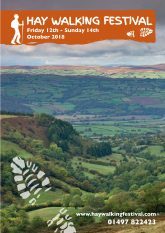 Please complete the Walk Leader Information form below and, if you already have a specific walk in mind, please also fill in the Route Card Template form for each route. Thank you!